The Los Angeles Philharmonic has a thing for star architects. 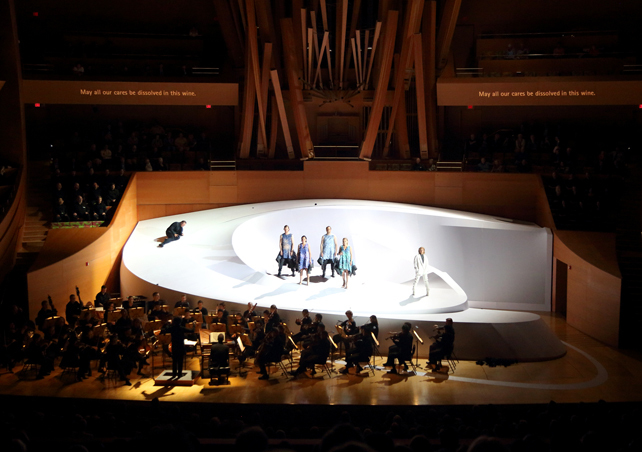 As part of a trilogy of Mozart operas directed by Gustavo Dudamel (himself a global celebrity), in 2012 Frank Gehry designed the set for Don Giovanni, in 2013 Jean Nouvel designed one for The Marriage of Figaro, and this month Zaha Hadid Architects has designed the backdrop for Così fan tutee, the trilogy’s finale. The firm’s curving white design, evocative of a skateboarding bowl (or a Corian sink? ), is meant to represent a large sand dune on the Italian coast. It was called “shape-shifting” by the LA Times. Its steep inclines have presented challenges to performers, but they seem to be adapting in rehearsals. Shows begin on Friday. Costumes were created by British designer Hussein Chalayan, who, like Hadid, is known for edgy, tech-heavy designs. And the director, Christopher Alden, is also known for taking risks. It seems like a combination that should stir things up, and perhaps produce a template for still-rare collaborations across disciplines.